GTM Owners Club Forum - View topic - Which k-series? I'm new round here and looking to find a Libra or K3 to play with. One snag is that I know very little (nothing) about K-series engines so need help in identifying the various versions. Google tells me the 1.4 engine (the one I'm most likely to get it seems) comes in various forms with 75, 82, 90 or 103 BHP, all are twin cam and some have VV so it's quite confusing to me. I suppose the engine code ought be best guide to identification but I find conflicting information on the internet so shall be grateful if someone will direct me to a reliable source for code interpretation. Also, the engine code may not be clearly visible so are there any other give away features on the engines to indicate what engine version I'm looking at? I'll be looking at a K3 said to have MG Metro 1396 donor engine so will be grateful for any information on that particular engine (HP?, were they of the VV type? etc). I have a k series manual at home with give the engine codes for various types - I'll take a picture of the engine code part and send it to you later. One thing I can tell you is that none of the 1.4 units had the variable valve gear (vvc), that was only fitted to 1.8's. Some of the early 1.4 engines used a completely different block with wet liners but I doubt you'll find one of those. Quite a lot of variables with k series as they were around so long. The internet is useful no doubt but has to be treated with care, one source I looked at seemed to suggest VVC was an option for all the K-series. You say it never was and I'd take your word (and other knowledgeable people in the forum) every time so thanks for that. Shan't now waste my time looking for a 1.4VVC engine. "Second evolution of engines (known as EU2) are in 1.4 16v (103bhp) , 1.6 16v (110bhp) and 1.8 16v (118bhp), and 1.8 VVC (143bhp) form. These are damp liner engines and are the most popular an easily available. Identifiable by the distributor cap on the end of the engine and a plastic inlet manifold, except for the vvc which has no distributor and an aluminium manifold with ‘VVC’ on it. The Third evolution of engines (known as EU3) are found in post 1999 cars in 1.1 16v, 1.4 16v (103bhp), 1.6 16v (110bhp), 1.8 16v (118bhp), 1.8 16v (135bhp, 1.8 VVC (143bhp), and 1.8 VVC (156bhp, known as the 160 engine). These are identifiable by a lack of distributor and a larger plastic spark plug cover (hiding a pair of coilpacks)." If you agree the above is true then I ought be able to easily distinguish between second and third generation engines. However, the author doesn't give much clue as to visual differences between first and second generation and I really don't want to end up with a low powered engine (the 8V ones?). Can you help me distinguish between first and second generation engines? For example, is the rocker box cover typically lettered with 8v or 16V? Much appreciate your offer to provide copy of codes. The 8v engines were single cam whilst the 16v were all twin cam so it's pretty easy to tell if an engine is an 8v. The cam covers will have twin cam 16 valve on them. An EU 2 or 3 engine is the way to go. Incidentally, I'm not sure they actually produced a single cam, 8v 1.4? Think the single cam engines were 1.1. 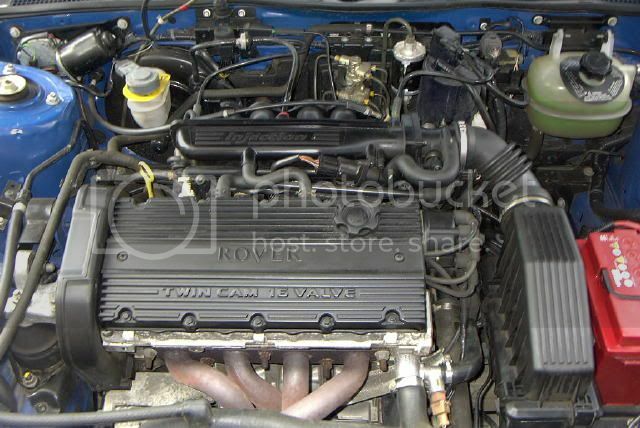 Also from your previous post, if the car you're looking at is a k3, it won't be an MG metro engine (old a series) but more likely a Rover 114 GTI which is the full fat 103hp 1.4. Can you confirm the EU3 engines:- "are identifiable by a lack of distributor and a larger plastic spark plug cover (hiding a pair of coilpacks)." Yeah thats right. They have a plastic part to one half of the cam cover which hides the coil packs. Will be viewing the car tomorrow and thanks to you shall feel more confident now that I know what I'm looking at. Let you know how I get on.